ATTENTION! – We have a limited supply of Poulvac Newcastle ik Vaccine available. Contact us at the link below to place an order for your pack(s)! We’ve developed a special kit for pigeon owners which allows you to work with other pigeon owners to share the large quantity of vaccine and just use what you need. Now you and a number of your friends can easily share a large pack of vaccine. Here’s how it works: Each of you buys your own standard kit. Prior to vaccination, each pigeon owner uses the large needle included in the kit and their own disposable syringe to draw out the vaccine quantity needed, then deposits it into his sterile bottle. Vaccine transferred into these bottles needs to be stored in a refrigerator at 2 to 8 degrees (the same as the larger pack) until it is time to vaccinate. When you are ready to use the vaccine, simply push the bottle onto the spike on the top of the vaccinator, and ensure it is set to 0.5 mL (or whatever your vet has recommended) and deliver the medication to each bird. DONE! Of course, if you’re not sure about any of the procedures to do with vaccination, we strongly recommend that you speak to your own veterinarian. In some States you are required to get a permit from your Vet before you can purchase the vaccine. The items pictured are the ones included in our standard kit. You can add extra items if required depending on how many birds you need to vaccinate. 1.) A plastic 0.5 mL adjustable multi dose bottle mount bottle mount vaccinator. 2.) 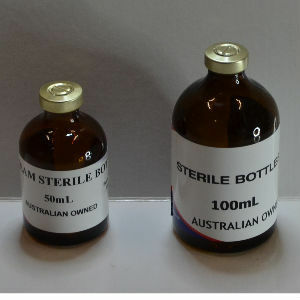 An empty 50 mL sterile glass bottle sealed with a rubber bung on top. These are also available in 100 ml, and both sized fit perfectly onto the bottle mount vaccinator mentioned above. You need to order 100 mL separately if required. 3.) 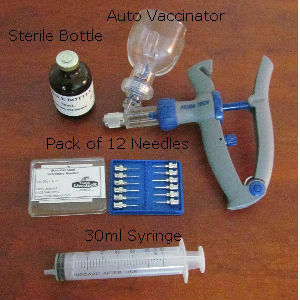 A sterile disposable syringe to use for drawing out the required amount of vaccine from the large 500 mL vaccine pack, and then putting it into your glass bottle. Standard supply is a 30 mL disposable syringes but other sizes are available on request. 4.) Needles. The standard kit has a tray of 12 x 20 gauge x 1/2 inch needles. We can also offer 20 g x ¼ inch or 20 g x ½ inch disposable needles (in packs of 100 needles per box), or else trays of 12 stainless steel reusable needles in either 20g x ½ inch or 21 x ½ inch. 5.) Decanting Needle. One 14 gauge x 1 inch, individually packed sterile needle for decanting vaccine. A thicker needle such is this is preferable for use when decanting vaccine as it allows the liquid to draw up more quickly into the syringe.